I first read about the phenomenon in a music magazine, but I cannot remember where. The article mentioned a 78rpm record by The Fontane Sisters on which they sing The Fortune Tellers Song . On each side of the record were two different versions of the song, all with different endings. Fascinated by this gimmick I wondered if this was the only multi groove record; I could not imagine that, because it seemed such a great idea. But it took me several years to find records with more than one groove on one side, and on the records that I found this gimmick is not used in a way that makes me play them more than once. 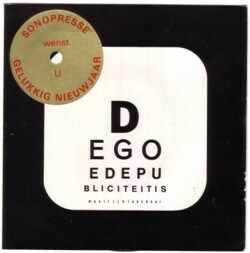 On a flexi record, that the Dutch company Sonopresse (much more about Sonopresse later!) made in the 70’s, the technique is explained and demonstrated. 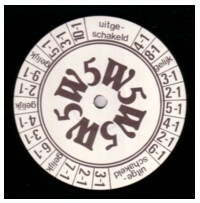 The record was meant as an advertisement for multi groove flexi records. It seems a great idea for promotional use, but as far as I know, no other multi groove flexi records were made in Holland. 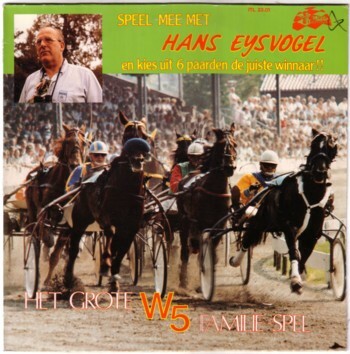 The only (other) Dutch multi groove record I have found so far is an LP with a horse racing game, W5. Well, actually the LP is the game: there are four grooves on each side and you can place bets on one of the eight horses. They all win in one of the grooves. The voice that comments this fake horse races is of Hans Eysvogel, who commented the real horse races in radio shows for decades in Holland. Everybody my age will have memories of this voice and the names of the horses: Speedy Volita, Henri Buitenzorg and Jojo Buitenzorg! Horse racing was not my cup of tea; I wanted to hear football. I remember that I didn’t understood why the guy got so excited about these horses. And he got very excited. I guess that many people expected he would die live on radio from an heart attack one day. There are more games made with this gimmick: I have a German multi groove record with a racing car game. But both the rest of the game and the sleeve are gone, and the record is damaged. So all I can offer for today is a track from the horse racing LP. Enjoy it!